The first Impala emerged in 1957 as a ’58 model year car, and yes—Impalas are still coming off the assembly line today. It’s not the same car of course. Now in its 10th generation, the modern Impala is very much a state-of-the-art sedan. Stylish and powerful, you’ll find it loaded with the very latest technology and safety systems. Here’s a look at how Chevy’s full-size sedan got to this point. This was the Harley Earl design era, and cars were big and bold. An Impala concept debuted in 1957, quickly followed by the production vehicle. Long and low, it was especially dramatic viewed from the rear where the “batwing tail” and cats eye taillights made a tremendous statement. ’59 saw the drama turned down a notch as Bill Mitchel took over the design lead at General Motors and the batwing became less prominent. Customers liked the look though and sales rose steadily. In 1960 Chevy sold 490,000 Impalas. New models were added, including a wagon, and as the decade progressed there was a third and then a fourth generation. By 1965, the first year of the 4th gen, annual sales were hitting 1 million cars. 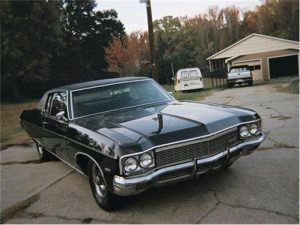 By ’69 sales were dropping and Chevy killed both the Impala wagon and the SS. Then, with what in hindsight was probably less than perfect timing, they unveiled the 5th generation Impala. This vehicle was the biggest Chevy ever produced. It was long, wide and low, and inevitably, consumed gas at quite a rate. Then the oil crisis hit and sales dropped below 600,000. In ’77 Chevy brought out the 6th generation Impala. Shorter and narrower but taller, it wasn’t what car buyers wanted and sales continued to fall. The first year of the decade saw sales go below 100,000, and they kept dropping. Production ceased in ’85, but was it forever or merely a hiatus? In 1994—to the delight of muscle car fans—Chevy brought back the Impala SS. 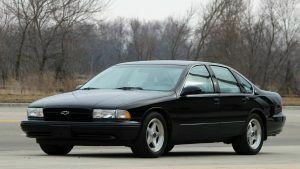 Based on the full-sized Chevrolet Caprice, this 7th generation sedan came only in black and was equipped with a 5.7 liter V8. The Impala remained something of a niche model. Sales weren’t huge and the Impala SS died again at the end of 1996. Their relative scarcity means today these cars are becoming sought after by enthusiasts. 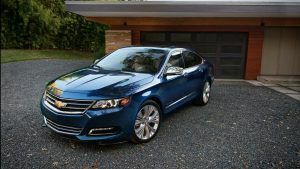 Someone at GM clearly believed the new millennium deserved a new Impala, and so the 8th generation arrived. In a departure from tradition, this was front-wheel drive and powered by a V6 rather than a V8. Sales were respectable though—“boosted,” if you’ll forgive the pun, by the arrival of a supercharged SS model in 2004. 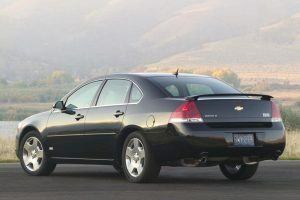 2006 saw a 9th generation Impala take up the baton. Still a large four-door sedan, this delivered comfort and quiet performance for those not attracted by the high seating, and high center of gravity, of SUVs. A 3.5 liter V6 was standard, although the Impala SS received a 5.3 liter V8. By 2014 the Impala was ready for an update… And did Chevy ever deliver! This latest generation car looks simply stunning from every angle. It’s long and low, as an Impala should be, and the sheet metal crease in the rear haunches pays homage to the original batwing design of ’58, as do the angular tail lights. Inside it’s every bit as impressive, with high-quality materials, a color touchscreen, and all the other equipment you’d expect in a car of this level. One other point to note: Kelly Blue Book has declared the 2018 Impala “Best Full-Size Car” in their 5-year Cost-To-Own awards. They say seeing is believing, so come take a look. Better still, schedule a test drive. You’ll be impressed by how quiet and comfortable this car feels—and it’s not often you get to say you’ve driven an automotive legend.